The vervet monkey is common across Southern Africa and may frequently be spotted from your safari accommodation. Vervet Monkeys are one of the smaller common primate species found throughout South and Southern Africa. They have pale grey fur covering their entire bodies from head to tail, with the only uncovered skin being their black faces surrounded by hair like a mane, and their blue bottoms that stick out from beneath their long tails. They are often seen scavenging on trash or leftover food within camps using their opposable thumbs to take apart and sort leftovers. Males have average weights of 5,5 kg (12,1lb) while females are slightly smaller at around 4,1 kg (9lb) in weight. Vervet Monkeys are not exclusive to Sub-Saharan or Southern Africa but are rather widespread throughout the great continent of Africa. Their range starts in the south of the Western Cape of South Africa near the coastline where from it goes east and up to the mainland areas towards the border. They are extensively found next to major rivers in South Africa, largely due to their water dependence. The eastern coast of Africa from KwaZulu Natal up to the diverse lands of Kenya north of the equator are all full of vervet monkeys who find life easier here in more tropical and wet environments. Vervet Monkeys are a very common primate species, and are in no significant threat to extinction or endangerment currently. Wherever you go in South Africa, whether it be in the Kruger or the Cape, you are very likely to see at least a single vervet monkey near your campsite or lodge. They have significant populations all over the country and are a very plentiful species even outside South Africa’s borders. The only threat to the species is their need for water, which largely explains its scattered population otherwise. Human interference hasn’t affected the vervet monkey’s health as a species as much as other animals. Vervet Monkeys are very diverse and adaptive animals. They are present in a great number of different habitats with vastly different plants that make up the vegetation in these habitats. Savannah and woodland areas teeming with life find themselves occupied with vervet monkeys, while sub-tropical and tropical forests or areas conversely are also home to these monkeys. Wherever there is enough water for them to survive, these primates will do so. 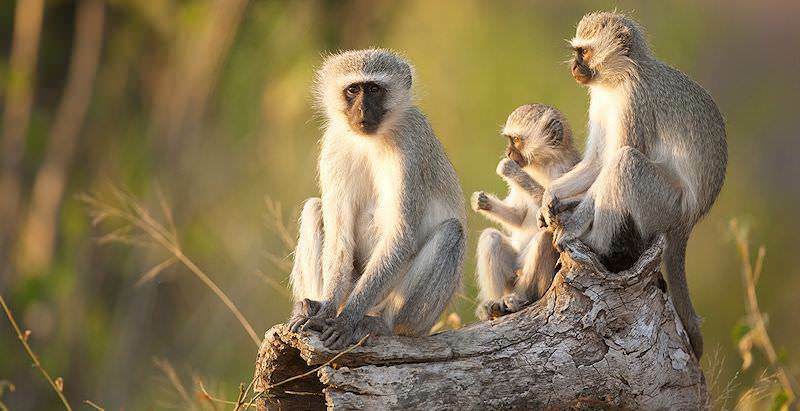 Rural and agricultural areas are also frequently inhabited by vervet monkeys, despite the unease and damage they cause farmers by feeding on the crops these farmers depend on for their survival. Vervet Monkeys organize themselves in much the same way as baboons do. They too form troops, usually slightly smaller than those of baboons however, averaging at around 25 individuals. In such a troop there are usually around 8 males, with the rest of their population made up of females and the young that are dependent on them. Both males and females within this group are territorial and defend the troop’s territories. Juvenile males leave the group once they reach maturity to find their own place in the habitat or in another troop and possible start their own troop. Females, on the contrary, stay in this troop of theirs to take the place their mothers once took up. Vervet Monkeys are quite specific in their behavior and have daily routines followed by most troops. They typically start their day by grooming one another whilst socializing near the tree they go to retire every night. Then at around 8 in the morning, shortly after sunrise, they start getting active. A troop such as this does everything together to so ensure more individuals survive with more eyes looking out for predators. Foraging, sleeping and just a nice afternoon rest to get away from the scorching hot sun leering down on the ecosystems below are all group activities amongst these monkeys. Vervet monkeys also communicate in profound ways, using their tails to visually communicate their mood or situation. Mating amongst these animals is an annual or seasonal affair. Females reach sexual maturity around 3 ½ to 4 years after birth, when they can start reproducing the next generation of Vervet Monkeys. Males reach a sexually viable age earliest at 4 ½ years. There are no partner preferences when it comes to copulation which means any males and females mate in any particular day. There is, however, evidence that suggests males higher up the hierarchy in a troop typically mates with more females than less dominant males. Gestation is typically a few months long, between the mating season that usually falls in the dry season and birth peaks in spring. Vervet monkeys are very vulnerable to a number of different predators, largely due to their terrestrial foraging habits and inferior size. Eagles and smaller species of cat make up their main nemeses in their battle for survival, in addition to the main predators every animal looks out for such as lions, leopards and hyenas. They generally react to the presence of a potential predator by giving out a distress or warning call to surrounding troop members, while also pouncing for the safety of tree tops or standing completely still in an attempt to hide in plain sight, waiting to see what their attackers will do.